TM-2000 Series Mobile Radios, 512 Channels, Scrambler. TM-8000 Series Mobile Radios 40-50 Watts with Matrix Display and Scrambler. F5011 - F6011 Series Mobile Radio, 45-50 Watts, 8 channels and interactive LED indicators. 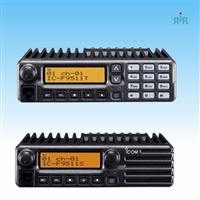 Icom F5021 - F6021 Series Business Mobile Radio 128 channels and 8 character alphanumeric display. Icom F5061 - F6061 Series Analog Conventional Mobiles, 512 channels, 128 zones. Icom F5061D - F6061D Analog, LTR, or IDAS™Digital Mobile Radios.s. Icom F2821 P25 Ready 45W P25 mobile radio with 256 channels, full keypad and an alphanumeric display. F5400 F6400 IDAS mobile with 1024 channels, a color display, and GPS & Bluetooth built-in. F7510-F7520 P25 conventional mobile radios with 1024 channels, a color display, and GPS & Bluetooth built-in. Icom IC-F9511HT VHF 110W P25 Conventional & Trunked Transceiver.